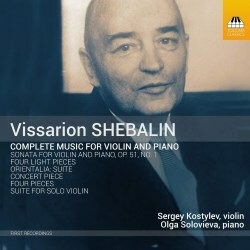 This is the debut recording of the complete works for violin and piano by the Russian composer Vissarion Shebalin (1902–1963). It arrives on the scene at about the same time as First Hand's attractive recording of the composer's Violin Sonata alongside rare sonatas by Myaskovsky and Nechaev. The usual roundabouts and swings are there to be negotiated. First Hand have the edge in eight minutes longer playing time, super-vivid sound and a wider span of substantial Soviet-era works. These include a first recording of the Myaskovsky and Nechaev sonatas. Toccata benefit from the concentration and singleness of purpose associated with a single composer's output. They also deliver this in eminently engaged performances by Kostylev and Solovieva presented in very natural and downright honest recorded sound. Shebalin was a traditionalist and rather like Boiko possessed a creative style that puts his music alongside that of Tchaikovsky but very mildly updated. This much is apparent from the present recital. His Four Pieces (1936-1946) comprise a passionate and eloquent Improvisation, a Gavotte that is precise, witty and delicately pin-sharp and not at all neo-baroque, a nostalgic full-hearted Remembrance which proceeds curvaceously through a drizzle of understated notes and a final breathlessly darting Scherzo. The Violin Sonata - a very late work - was the first of three sonatas for stringed instruments. Its Allegro is an emotional piece with less ebullience than amiable grace but it rises at times to something higher. The Scherzando has the feeling of a vigorous village dance. It could perhaps have gone with even more verve than is summoned up by Kostylev and Solovieva. Then again, the secondary marking is Non troppo vivo and this is especially faithfully observed with in the central 'icicle' dripping passage. The Andante has the weighty melancholy ways and emotive passion of Myaskovsky. The final Allegro is a cheery dance and provides a good balancing final statement for all that has gone before. The melody it deploys at 00:53 is a treasure. Shebalin had a captivating way with him. The heart-warming and supple Concert Piece skips and gambols along. The liner-notes tell us that the finale of the Sonata relies on material from this piece and it certainly makes hay with various virtuoso performing devices. It does so yet achieves a natural musical effect. The Four Light Pieces are a gracious, modest and companionable succession of pieces dubbed Minuet (twice), Berceuse and Giga. They bear some similarity to the violin and piano music of John Ireland. The four- movement Suite for solo violin is the earliest work here. These are evidently Bachian studies and although entertaining and surely instructive have little emotional sap. There is a long tradition in Russian music of Oriental inspiration. Orientalia is in that category although the Moderato carries as much of the fragrance of the salon as of Samarkand's sinuous wonders. The Andante assai is a gently Tchaikovskian work - weighted with sentiment. The finale, Allegro molto, insistently stirs the pulse and has a fine Eastern twist to the theme and treatment. Over the years Shebalin has not been without a place in the catalogue. Recordings have included the nine string quartets, five symphonies (review review review), and the Violin Concerto on Regis. Toccata find a home for CDs of his choral music and a first volume of his orchestral music other than the symphonies. Shebalin may also be familiar as the supplier of an orchestration and completion for Mussorgsky's Sorotchynsi Fair. We can also hear him in playing by the Russian musical Royal family in the shape of Oistrakh, Knushevitsky and Oborin. This takes the form of one lyrical and heart-searching movement from Shebalin's romantic Piano Trio in A (1947); this courtesy of Brilliant Classics 9272. The notes, well stocked with facts and specific to each work, are by Paul Conway, a respected, increasingly familiar and sought-after figure in the industry.